Dr. Todd Austin also known as 'The Bat Doctor' was one of three speakers at the Lake County Forest Preserves Batfest 2009 in Wauconda, IL. Dr. Austin also manned the Bat House Info Booth at the event which attracted over 600 bat enthusiasts. July 13, 2010 - PRLog -- On Saturday, August 1, 2009 Dr. Todd Austin of Virden was one of three featured speakers at the Lake County Forest Preserves Batfest 2009, which was held jointly at the Lakewood Forest Preserve and the Lakewood Discovery Museum in Wauconda, IL (a northern Chicago suburb). The event attracted over 600 bat enthusiasts. Austin, a Doctor of Chiropractic from Virden, IL has been an active member of Bat Conservation International (BCI) for nineteen years. Austin is also a veteran member of Toastmasters International. Toastmasters taught him how to take his enthusiasm for the world’s only flying mammals and turn that into exciting BAT presentations that others can learn from. Austin has been professionally speaking to audiences about bats since 1996. Since that time he has helped to educate over 2,000 people of all ages about these fascinating fliers of the night. Austin, who speaks to groups about how bats are beneficial both economically and ecologically, is often referred to as Virden’s ‘Bat Doctor’. “My job as a BCI volunteer is to go out and change preconceived negative attitudes about these incredibly beneficial animals”. Austin also manned a bat house information booth at Lakewood Forest Preserve prior to his presentation. He showed people examples of bat houses that do and don’t meet criteria for attracting bats. He also gave out copies of BCI single chamber bat house blueprints and a list of his ‘6 tips for attracting bats to your bat house with an 80% success rate within 1 year’. Austin informed those interested about the many bat house resources available from BCI and handed out BCI brochures. 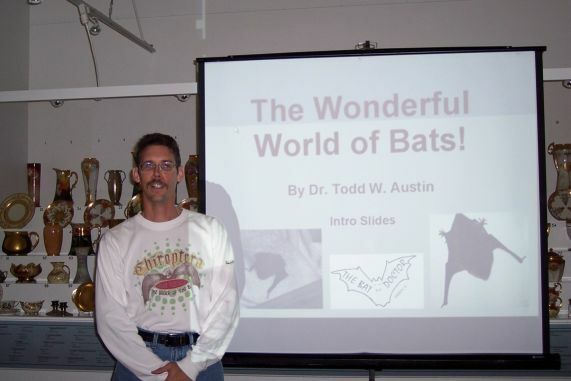 Dr. Austin spoke to an audience of approximately 120 children and adults at the Lakewood Discovery Museum using his PowerPoint presentation called “The Wonderful World of Bats”. Austin has compiled a set of over 200 slides that he uses for his bat programs. Many of the photos are courtesy of BCI founder and long-time president Dr. Merlin Tuttle, who is known as the ‘world’s leading bat photographer’. Roughly half of the slides are from Austin’s own personal work with bats. The presentation was 25 minutes long. • Photo caption: Dr. Todd Austin, a bat conservationist from Virden, IL was one of the featured speakers who delivered a PowerPoint presentation entitled “The Wonderful World of Bats” to an audience of 120 people at the Lakewood Discovery Museum in Wauconda, IL as part of the BATFEST on August 1, 2009.